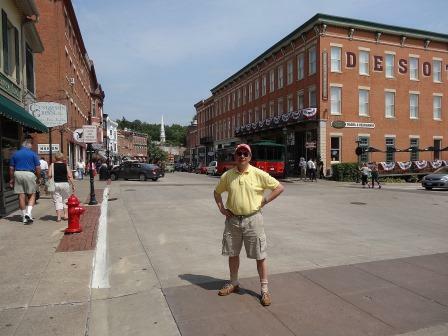 We have history in Galena, a town that once was a major center of commerce but now is a prime Midwest destination for visitors. More than a dozen years ago, we owned an investment condo in a new development among the rolling hills and hallows just east of town. The investment, let’s say, was not the best expenditure of financial resources. So we sold it and had not returned to Jo Daviess County and the storybook — well, for Illinois — community since. When we visited in August, we found that what attracted us to the area was intact and just as special. Picture post card weather certainly helped. Stopping on a side road at night and hearing a symphony of cicadas, crickets and other insects. It was near deafening, but thrilling to enjoy beneath a starlit night sky. Recognizing some new developments in and around town, but not too many to spoil the character of the area. The room we had at Eagle Ridge Resort, which faced woods, included a modest deck and offered privacy. 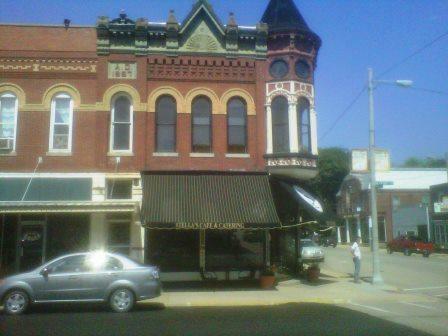 Lunch at Stella’s Cafe in nearby Stockton, IL, where we had an outstanding meal served by genuinely friendly people. My BLT arrived on homemade bread and featured lots of bacon and real, home grown tomatoes. The “musical stylings” of a singer/guitarist who performed in the Eagle Ridge lounge each evening. He wore a cowboy hat, and deserved to. And, he sang “Happy Birthday” to me. And now, a few visual memories. The good shots were taken by Susan with a good camera; the not-so-good shots came from my trusty BlackBerry. 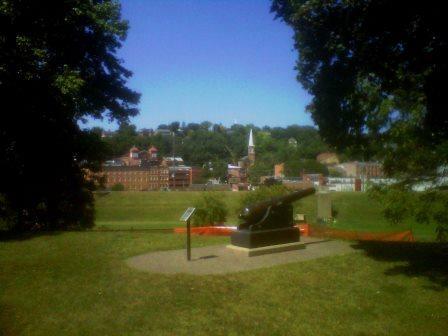 The view of Galena from Grant Park, which overlooks downtown. 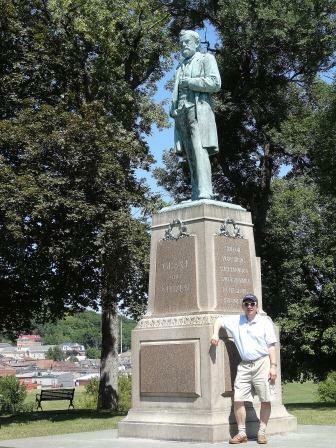 The town is known as the home of U.S. President and Civil War hero General U.S. Grant. His home is here, and there’s a golf course named for him. Standing on Main Street, I blended in with the other visitors with my cap, polo shirt and shorts. But imagine what this street was like 120 years ago. 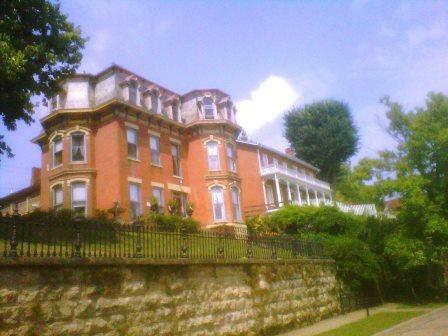 One of the grand mansions on the bluffs above downtown. 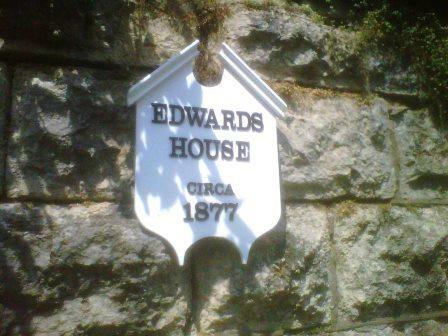 It’s now a B&B. Great to know cool structures can be preserved. How could you not like a town with a home named after you? Actually, I was born a few years later. 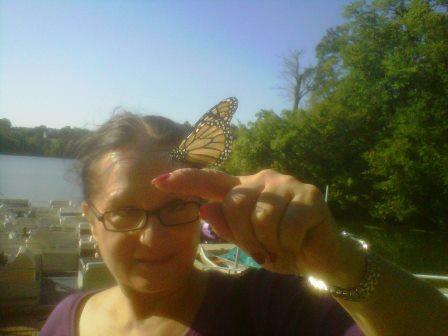 Susan with a friendly butterfly who greeted us on the dock at Lake Galena behind Eagle Ridge Resort. 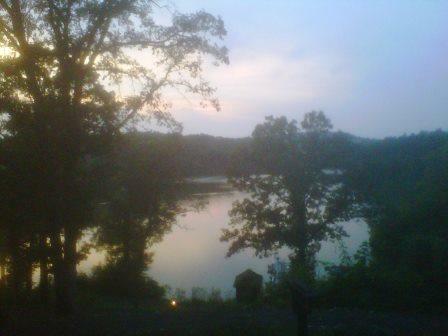 Lake Galena at sunset from the hill behind Eagle Ridge Resort. Serenity. Quiet. Peace. A great spot to ponder the good things about life. Stella’s Cafe on Main Street in Stockton. just east of Galena. 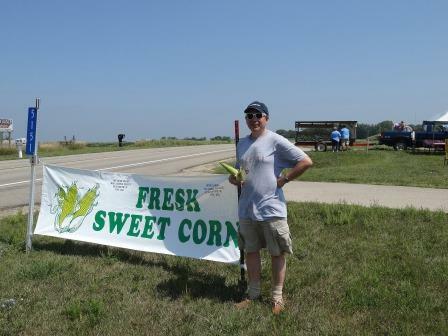 A trip to farm country would not be the same without some farm stand produce. And, yes, the corn was delicious. Galena is known as “the town that time forgot,” because remarkable number of well-preserved century-plus old homes and storefronts. We forgot about Galena, figuratively of course, for several years. Our visit last month rekindled old memories and brought new ones. We’ll be back. Have you visited Galena? Share your memories. This entry was posted in Uncategorized and tagged Eagle Ridge Resort, Galena, General U.S. Grant, IL, Illinois getaways, State of Illinois, Stockton, weekend getaway. Bookmark the permalink.